Daddy, let's read the Bible together! Davis is 2.75! He will be 3 in January. Ever since this summer, he has had a big interest in the Bible. It does not matter what book I am reading, he thinks it is a Bible. Well, recently he has been getting up as soon as I get back from the gym (he hears me come back home and the stupid dogs bark). This means...I am doing my devotions the first hour he is up. He is taking more and more interest in it. 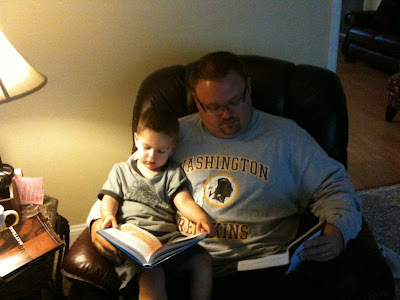 Well, he blessed my heart this morning in a BIG WAY when he said, "Daddy, let's read the Bible together!" 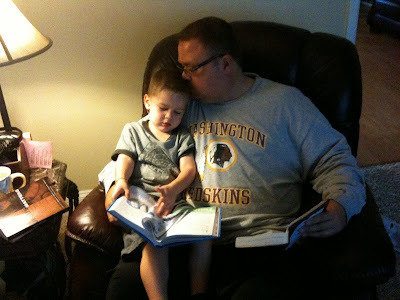 He got his "Little Warrior Bible" and I got mine and we read the Bible together. He stayed on my lap for 15-20 minutes and we alternated reading his, then mine, then his, then mine (as he dictated, of course)! I am learning so much about influence and legacy as I raise this little guy. They like what we like. They act how we act. They say what we say. We talk about Jesus, they talk about Jesus. I am proud of my son! I pray with him and for him every single day. "Daddy, let's read the Bible together!" Love God, Do What He Says!